Sarah Schulz’ pitch was painful to watch. She’s the founder, baker, and mastermind behind Schulzies Bread Pudding. Despite her enthusiasm and passion for her product, her lack of preparedness and lack of knowledge of the facts and figures of her business was her downfall. She was seeking an investment of $160,000 for a 20% equity stake. She had invested $300,000 of an inheritance from her father to grow her company to its present state. Walking confidently down the hall she stood before the panel members and rallied them with an enthusiastic “Are you guys ready for something good? Are you guys ready for something new?” Her introduction was catchy and from there she should have gone into further details about Schulzies Bread Pudding. An assistant to pass out the bread pudding samples would have left her free to focus her attention on her pitch. The Sharks were clearly impressed with the samples they received and complemented her on the delicious desert. When Kevin asked how many calories were in a cup, Sarah countered with a joke about her baby bump and “you won’t look like this if you keep eating bread pudding”. In a climate where consumers are very health conscious, a good selling point for her product would have been if she knew how many calories per ounce were in a cup of bread pudding. Between bits of delicious bread pudding, Lori asked Sarah to tell them “what the business is” about. At this point Sarah should have been really paying attention to what that query really meant. Preparation of a brief history and memorizing it would have streamlined and clarified her answer, that the idea of a variety of bread puddings being sold at one location is a new concept and no one else is doing it. That she began selling her product at a small window front on Venice beach and that the first year’s sales was “X” amount of dollars in a space of “X” amount of square footage. Instead her response was all over the place, making it difficult to get a straight answer. Sarah did manage to tell about her first location, a “little window” on Venice beach, which did well for one and a half years. She recently did an asset purchase agreement to let someone else run the business, so she could pursue her vision of a bread pudding parlor in San Francisco; to which Barbara responded with “you ran away from your business!” As she continued on about her dream of a bread pudding parlor, Kevin interrupted to inquire about the “little window” in Venice. Kevin did the math and was actually impressed with the figures. The previous year, the 140 square-foot space made $190,000 in sales, which is $1,300 per square-foot. However, he was not impressed with the new 800 square-foot space in San Francisco that only generated $450 per square-foot in sales. At that rate, the company would make no money when overhead and fixed expenses are taken into consideration. When asked how she ended up in San Francisco, her answer did not clarify why she moved from a financially lucrative location to one that was not doing so well. It was evident that not much thought was put into this decision. Sarah then admitted that she didn't do any marketing, so potential customers really didn't know the store existed. A simple cost comparison of the old location and the new location would have clearly shown that opening up the store in San Francisco would not be a financially lucrative decision. When asked how much she spent and where she got the money from, the Shark Tank gasped in disbelief – she’d received a $300,000 inheritance from her father’s estate and spent every last dime of it. Something tells me the poor man is rolling over in his grave now. Continuing on passionately about the bread pudding parlor in San Francisco, Sarah Schulz held up a mock-up of the store, to which Mark quipped in “so you’re a yogurt store for bread pudding”, basically deflating the whole presentation. Despite Sarah’s enthusiasm as “an entrepreneur that has ideas”, the Shark Tank was “out” for the count on Schulzies Bread Pudding. Her poor presentation and lack of a business plan all contributed the Sharks passing on this venture. The Sharks left her with these parting words: Kevin nailed it on the head when he said “what’s missing in the presentation is the operation execution aspect – there’s no business plan”. Barbara, going with her instincts as usual, was out, conveying her feelings that she couldn't imagine making money with Sarah as a partner. Robert pointed out the obvious, saying that there was simply no business plan that he could get excited about. Mark’s advice was that she desperately needed a partner who could guide her, and then told her that “you've got a great idea, but you’re biggest risk is you”. Ouch! Lori quoted Ralph Waldo Emerson “Don’t go where the path may lead, go instead where there is no path and leave a trail.” Sarah had a great idea however she didn't see her as “being there” yet. 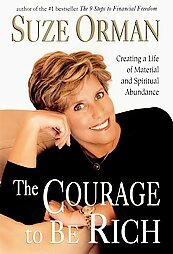 My parting words: Sarah would have benefited greatly from Suze Orman’s book The Courage to be Rich which teaches that “money is attracted to people who are strong and powerful, respectful of it, and open to receiving it”. Sarah did not convey any of this. She squandered the $300,000 which she inherited to go from a financially successful location, to one that is not. This so clearly illustrates the concept that when money is readily available, people will often jump in feet first into a business without doing their homework. She stood before the Sharks without a business plan asking to be entrusted with $160,000 simply based on her passion for bread pudding, claiming that “the direction is there” for the company. But as we all know, “ a mental note isn't worth the paper it’s written on” (Samuel Goldwyn). Finally, the book “Write It Down, Make It Happen” by Henriette Anne Klauser would also benefit Sarah. When you have a goal you must also have a clear-cut plan on how to achieve it. If she had marched into the Shark Tank and passed out copies of her business plan or even just a cost sheet, I am sure that all of the Sharks would have been very impressed. Going forward, do your homework. Because, as Benjamin Franklin so famously phrased it, “by failing to prepare, you’re preparing to fail”.